China has released a new global 30 m resolution landcover data set for ca 2010. From the first glimpse looks better than Globcover, even CIMMYT’s research station in Sonora is properly classified as artificial surface and towns that were absent in Globcover. User registration and login work well but still waiting for the download links for the the actual tiles. Hope enough of you can try this out so we can see if its worth using broadly but seems promising. CIFOR scientist David Gaveau talks about new research on the 2013 fires in Indonesia that caused haze in Malaysia and Singapore. He also talks about the possible effects of the new Singaporean haze law, and why more research is needed. Extreme episodes of trans-boundary haze in Southeast Asia in 2013 and 2014 — and an anticipated El-Niño-induced drought during the second half of 2014, which could result in significantly heightened fire activity across Indonesia — have focused attention on causes and origins of fires in peatland areas of Sumatra. It has also prompted the affected countries in the region to develop policies to mitigate future fires in the region — as well as penalties for those who start the fires. Indonesia’s vice president has convened senior ministers from several agencies to combat the problem, and a special “situation room” is being established to ensure firefighting capabilities and response within hours after new fire hotspots are detected by satellites. In parallel, Singapore has drafted a bill that would allow it to fine companies for fires that take place on their plantations. (Haze wafting from Indonesian fires in June 2013 choked the skies of Singapore, causing record-high levels of air pollution.) 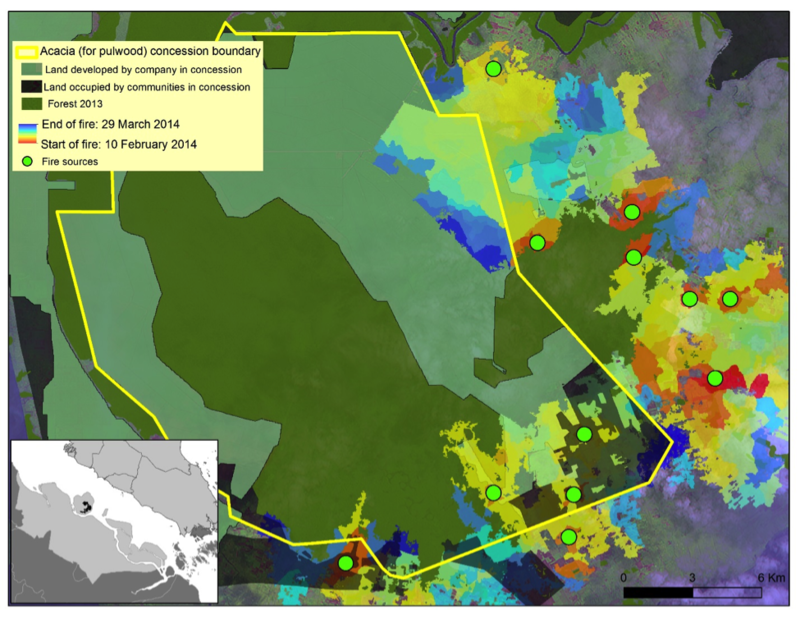 Singaporean authorities, as well as many advocacy groups, now blame plantation companies (large-scale operators) for the recent burning, based upon analyses of fire hotspots and cadastral maps showing that over half of hotspots during the recent 2013 and 2014 fire event in Sumatra was within concessions — i.e., land allocated to companies for plantation development of industrial-scale monoculture oil palm and Acacia. Policy interventions for mitigating fires require solid information on who is setting fires to whose land. However, this basic information is missing, because competing claims over land ownership in Indonesia gives rise to confusion over who is setting fires to whose land. Land use and land tenure in Indonesia are governed by a tangle of national, provincial and customary laws that often compete with each other, resulting in confusion over who owns which bit of land. This situation is exacerbated by an influx of land-seeking migrants and by investments in agricultural expansion by mid-level investors of unknown origin. Tensions — and occasionally conflict — can arise among these land users. Another confounding factor is the fact that fires move across the landscape, propelled by topography and wind. Land within a concession boundary may not be fully controlled by the corporation in question. A large part may be claimed and occupied by unrelated land users, and these land users may be the ones who start fires in the concessions. Fires can start outside the concessions and spread into the concessions. We show here that it is possible to produce detailed maps of land use in concessions, showing the areas occupied by unrelated land users (small-scale and mid-level operators) using before-and-after fire images from NASA’s recently launched LANDSAT satellite. We can also produce detailed maps of fire progression, showing where fire starts and where fire ends, using a combination of LANDSAT and fire hotspots data. We applied our methods to the February and March 2014 fires that generated the two largest burned areas in Riau province, Sumatra — one in Bengkalis district and one on the nearby island of Pulau Rupat. 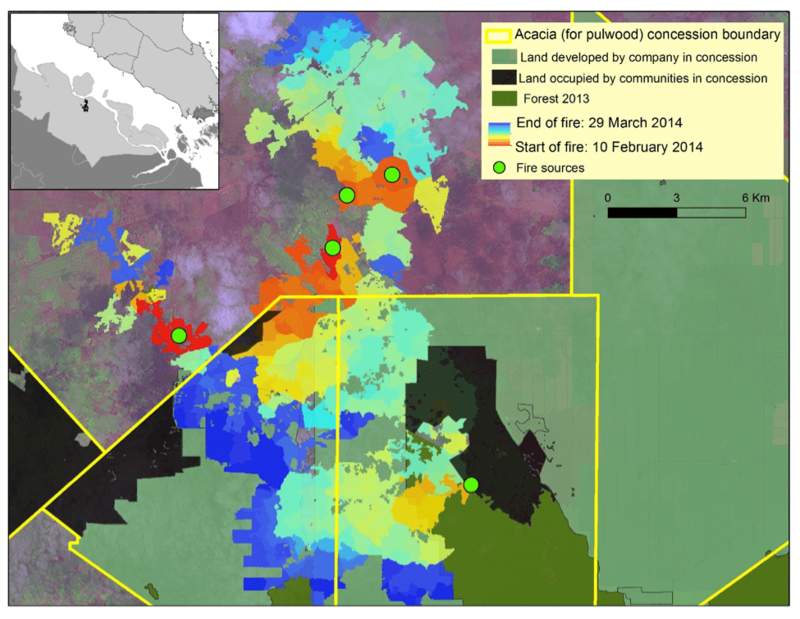 Our analysis reveals that the fires either started outside concessions, or on land occupied by small-scale operators (local or migrant communities) within the concessions (see Figure 1 at top, and Figure 2, below). While our analysis should not be read as completely absolving companies — as companies have in the past used fire to clear land — it does show that the situation on the ground is more complex than is often portrayed, and that companies are not always entirely to blame when fires are started on their concessions. Our findings are likely to complicate efforts to hold companies accountable and to penalize offenders. Our analysis points to the need to continue — and expand — this type of monitoring, and to move away from assigning blame simply by overlaying hotspot and concession maps. The situation on the ground, as we now can see, is more complex than that. During the week of July 14 – 18, 2014 the CGIAR-CSI representatives came together in San Diego, California to be part of the ESRI (Environmental Systems Research Institute) User Conference. The conference gathered over 16.000 participants to share their common interest in maps, data, remote sensing and the latest GIS technologies. CSI members across 7 CGIAR Research Centers attended the conference to present research results: David Brown from Bioversity, Bernardo Creamer, Elizabeth Barona, Ernesto Girón, Glenn Graham Hyman, Jorge Cardona and Silvia Elena Castaño from CIAT (International Center for Tropical Agriculture), Kai Sonder from CIMMYT (International Maize and Wheat Improvement Center), Henry Juárez from CIP (International Potato Center), Maria Comanescu and Ulrike Wood-Sichra from IFPRI (International Food Policy Research Institute), Tunrayo Alabi from IITA (International Institute of Tropical Agriculture), and Ameer Rajah and Kiran Chandrasekharan from IWMI (International Water Management Institute). Since we, the members of CSI (Consortium of Spatial Information) share the love for maps and see the value added of information delivered through maps, we prepared presentations of our research: The RTB (Roots Tubers & Bananas) team showcased their work in a series of presentations on crop distribution, and abiotic and biotic constraints to production of roots, tubers and bananas: http://www.rtb.cgiar.org/rtb-gis-initiative-promotes-open-data/. The IFPRI team presented the HarvestChoice program and one of its most important GIS tool – Mappr. HarvestChoice’s purpose is to collect and assemble biophysical, agricultural, socio-economic, and market access data and help investors, policymakers and program managers to make better and more informed decisions in Africa South of Sahara. We are always excited to be part of such an important event which brings together people from all over the world sharing a special interest – to make the world a better place using maps. Far too often our research and development activities remain hidden in difficult-to-find places, limiting its potential to achieve impact. A group of seven professionals applying spatial analysis and geographic information systems (GIS) to roots, tubers and bananas (RTB) research is working to change that. They met last week in San Diego, California in conjunction with the Environmental Systems Research Institute’s (ESRI) International Users Conference to share results of their work on RTB crops. The meeting was sponsored by the RTB Research Program and the Consortium for Spatial Information (CSI), both CGIAR initiatives. The researchers – a RTB team of GIS professionals – presented their research on mapping soil organic carbon in cassava fields, participatory research for biodiversity monitoring of potato, use of GIS for assessing banana fusariam wilt disease, a multi-criteria decision support system for priority setting in RTB crops, an open database of evaluations trials and an online digital atlas called RTBMaps (see summaries and links to the research presentations below). One aim of the group is to share useful geographic information developed by RTB researchers with the larger agricultural research community. They share this knowledge through RTBMaps. RTBMaps brings together spatial information on RTB crop distributions, abiotic and biotic constraints to RTB production, socioeconomic conditions and other map information relevant to these crops. The group puts this information in the public domain for use by the research and development community working on RTB crops. Future development of the Atlas will include new map layers on pests and diseases, climate change impacts on RTB crops and other layers of interest. Ultimately the group expects to motivate new research and development activities that build on these knowledge and information resources. RTBMaps is an online GIS tool to visualize production, constraints and social indicators associated with Roots and Tubers and Bananas (RTB) crops. Information mapped by the tool, includes data on pests and diseases, evapotranspiration rates, vulnerability to failed harvests, fertilizer application rates and the incidence of malnutrition in children. With this project the power of maps will be out of the GIS lab into the hands of the RTB science community-CGIAR scientists and partners worldwide. Biodiversity sustains a wide variety of genetic traits that are very valuable for the potato’s adaption to changing environments and successful cultivation in the future. However, several factors are threatening biodiversity in the Andes. For this reason, it is necessary for monitoring to be done with a standardized system and common observation parameters. Here we explain how participatory mapping and survey methods are used for the systematic monitoring of potato landraces in the Andes. Using ArcGIS Desktop we applied different criteria to select a group a 149 farms to conduct the first stage of a study in San Luis de Shuaro, Peru. Due to access difficulties found on this region, the study would have been much more difficult and cost much more in terms of resource allocation had we been unable to utilize GIS. GIS tools allow the handling of spatial criteria data to be assimilated and interpreted by groups of experts when evaluating solutions to complex problems.This project uses multicriteria decision analysis to support geographic targeting of interventions in crop improvement for main agricultural crops, by using an application called SIEMPRE, which is GIS aided online, and is used to elicit expert opinion to value alternative solutions utilizing the Analytical Hierarchy Process (AHP) methodology. This presentation describes an application that organizes and manages evaluations of crop cultivars at sites across the world. The application can serve this data and includes multiple opportunities for linking systems that deal with these types of data. In the presentation, we demonstrate the development of an online database to manage evaluation data, linking this data set to geographic representations online and providing the data as a service to other applications. “Time to model all life on Earth” – Agriculture? A recent Nature Comment article discusses the need for developing GCM-like General Ecosystem Models (GEM) to simulate whole ecosystems. The article also introduced few prototypes already being developed, including the Madingley Mondel that the lead author’s institute, Microsoft Research, is developing in collaboration with UNEP World Conservation Monitoring Centre (UNEP-WCMC). The article suggests “… coupled with models from other fields, such as economics and epidemiology, they could offer a means of managing human actions and the biosphere in an integrated, consistent and evidence-based way.” This, of course, should apply to the agricultural activities and their interactions with the large ecosystems and their services. Speaking of which, ins’t it also “Time to model all agriculture on Earth” (General Agroecosystems Models – GAME)? Microsoft Research and the UN team up to build a computational model of ecosystems across the worldMicrosoft Research and UN scientists have teamed up to build the first general-purpose computer model of whole ecosystems across the entire world. The project was detailed in a recent Nature article titled “Ecosystems: Time to model all life on Earth,” which unfortunately requires a subscription. Geographic targeting for the Roots, Tubers and Bananas (RTB) research program. Researchers from IITA, Bioversity, CIAT and CIP met last week at CIAT headquarters in Cali, Colombia to advance geographic targeting and priority setting for the Roots, Tubers and Bananas (RTB) research program. Our activity is a background analysis for the larger RTB priority setting process that extends into the middle of 2013. The aim of the work is to consider the geographic dimensions of priority setting for the RTB crops – potato, sweet potato, yam, cassava, bananas, plantains and others. RTB researchers included professionals from the GIS labs of the four partner centers, economists working in impact assessment and several others. The team is analyzing problems and opportunities for RTB crop development, such as poverty and socioeconomic conditions where these crops are prevalent, biotic and abiotic constraints to crop production and yield gaps. The key activity in the analysis looks at the spatial coincidence of RTB crops with poverty, population, demography, drought, excessive heat, soil constraints, pest and disease problems and many other considerations affecting where to target R&D interventions. Where should RTB focus efforts? What are the best bets for targeting technology to its ecological and socioeconomic niche? Our team is working to answer these questions and many more. Other activities in the project include a broad-scale yield gap analysis for identifying the places where R&E might have the most impact, places where crop yields are well below their potential. Finally, the team is creating an online digital atlas on everything related to RTB crop development. Nov 12-14 Roots, Tubers and Bananas workshop in Cali, Colombia at CIAT HQ. Front row Left to Right: Guy Hareau, David Brown, Henry Juarez, Bernado Creamer, Tunrayo Alabi, Elizabeth Barona, Martha del Rio Duque; Second Row: Flavio Avila, Glenn Hyman, Diemuth Pemsl, Ulrich Kleinwechter, Tahirou Abdoulaye, Ernesto Giron; Third row: Holger Kirscht, Joe Guo and Reinhard Simon. With a wide view of the future where plant breeders have the tools to breed crops in marginal environments with greater efficiency and accuracy for the benefit of the resource-poor farmers and their families, the Generation Challenge Programme (GCP) has carried out a broad access and proactive distribution platform as a consolidated vehicle for dissemination of knowledge, tools and services around crops breeding. The Integrated Breeding Platform (IBP) is particularly intended to boost crop productivity and resilience for smallholders in marginal environments by facilitating access to cutting-edge breeding technologies and informatics tools hitherto unavailable to developing-country breeder. One of the useful informatics tools is called “Generation Atlas”, a GIS-based web mapping tool that allows researchers, policy analysts, students and others interested in crop improvement to explore constraints and opportunities of agricultural production throughout the world. The new IBP Generation Atlas is a comprehensive compilation of online maps and geo-processing tools that use a combination of Google and ArcGIS Server technologies, integrated with databases like Google Fusion Tables synchronized with IFPRI and CIAT relational database management systems (RDBMS) to provide access to trial sites information from AgTrials, the Global Agricultural Trial Repository initiative, historical climate data, WorldClim data, generic soil profiles, soils from various sources and many more valuable information from HarvestChoice. The web map about shows farming systems and trial sites from AgTrials repository. You can explore the map using your mouse, clicking on the red points or just go to the Atlas for visualizing more map layers and useful information such as weather stations, climate, global crop distribution, planting date, soils, soil constraints, seasonal drought index, failed season, population, percentage of children less than 5 yrs old stunted, phenotyping field sites, among others. For further information you can contact to Glenn Hyman at CIAT or leave us a comment. RTB (Roots, Tubers and Bananas) Workshop was held at CIAT‘s headquarters in Cali, Colombia on 12-14 November 2012. We have 19 people from IITA, CIAT, CIP and Bioversity. One of our objectives is to test out cloud technology for sharing geographic information. We are using resources from the CGIAR Consortium for Spatial Information’s (CSI) agreement with Environmental Systems Research Institute (ESRI). The technology is ArcGIS Online. The four CGIAR centers are pooling together their data and putting it in ArcGIS Online. Here below is a map of irrigated areas from the International Water Management Institute (IWMI) overlaid on a maps of John Dixon’s Farming Systems map. Use your mouse to pan and zoom around the maps. Note you can pan to different parts of the world. This blog post is calling the ArcGIS Online system and data stored on the cloud. So far, we are quite pleased with the drawing speeds. We did have some difficulty getting everyone signed on to the system, but we did manage to do with only a 25 minute delay in our agenda. Today we are discussing input data into a multi-criteria evaluation process. Tomorrow, we split up into group according to crop, and begin thinking about the geographic dimension of RTB priorities. For further information about the CSI geospatial platform initially used to support RTB project and soon more CGIAR CRPs, please contact your GIS Team in each center or leave us a comment here to follow up and help you anytime. IFPRI’s magazine, INSIGHTS, features a story of Emily Schmidt – who’s been working with Ethiopia’s Central Statistical Agency (CSA) to train statisticians across the country to use GIS for analyzing and visualizing the agricultural statistics data they produce. The close collaboration enabled CSA to produce their own series of atlases over the years. Now the successful training program is being expanded to Malawi and Mozambique. On the Road | IFPRI Insights MagazineIn a vast, rapidly developing country like Ethiopia, data-about everything from literacy rates to the number of flour mills-is essential to policymaking. For the country’s Central Statistical Agency (CSA) and its regional branches, translating mountains of raw data into useful information to support policymaking in a timely manner is a major task. Tracking farmers’ mobility silently – Holy grail? Back in 2009, Silvia Renn (World Fish) blogged her review of a Nature news article describing the possibility of using mobile phone to monitor human behaviors and public health and noted the untapped potential of such data and technology to detect human behavioral patterns in agriculture. Following up on the story, Science recently published an article more deeply mined such mobile phone-based location data and attempted to quantify the impact of human mobility on malaria . Quantifying the Impact of Human Mobility on MalariaHuman movements contribute to the transmission of malaria on spatial scales that exceed the limits of mosquito dispersal. Identifying the sources and sinks of imported infections due to human travel and locating high-risk sites of parasite importation could greatly improve malaria control programs. Here, we use spatially explicit mobile phone data and malaria prevalence information from Kenya to identify the dynamics of human carriers that drive parasite importation between regions. As Silvia earlier noted, I also think such mobile phone-based location data and its mining technology could start unlocking answers to so many research questions involving human, or farmers in our case, behavior. There are, of course, concerns on the subject and their privacy, but let’s put it aside for a moment. On one possible example, not necessarily fully relying on costly surveys, we could exactly pinpoint when, how many times during the growing season, farmers visit which fields, located where, for how long (as long as they keep carrying the mobile phone, that is). We may still need some in situ surveys, but we will have much better ideas on which types of management event happens, when, where – so that we can ask a lot more informed questions and hopefully useful answers. At some point after harvest, we could also track their travel from the field to the market, the mode of transportation, travel time, etc, to understand their market accessibility and value-chain of the product. We can even guesstimate how much production they may have this season, based on their farming product transportation to the markets. We will have better ideas on the production cost side as well. For the public health side, we’ve been hearing the location of hospital/clinic doesn’t mean much; how many doctors and nurses there are now is a lot more critical issue – but it’s very difficult to keep track. Imagine we can keep track people’s time to travel from their home/village to the health clinic, how busy the facility is, how long they stay in the facility, what’s their next destination (another clinic, bank, or going back home); good interpretation of such information could lead us to much better real-time understanding of what’s happening on their livelihood and when/whether to trigger an alarm. Anybody wants to put more thoughts and construct a concept note together? Let me know! Higher temperatures and changes in rainfall patterns could transform the agricultural landscape of Central America, threatening the livelihoods of one million maize and bean farmers, according to a pioneering report released today that for the first time takes a specific look at the impact of climate change on a local level.